What Countries Does a Mongoose Live in? Rudyard Kipling fans may remember Rikki-Tikki-Tavi, the mongoose hero of one of Kipling's "Jungle Book" stories. He was an Indian mongoose, but you can find mongooses in countries stretching from Indonesia to Africa. 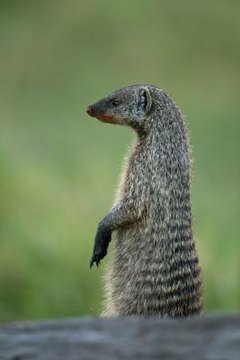 In fact, apart from a slim belt running across Africa, approximately where the Sahara desert is, the entire continent is home to the mongoose. Introducing the mongoose into non-native countries has sometimes proved problematic. There are some 30 species of mongoose sharing common characteristics: they're small, fast, carnivorous and work in gangs. The mongoose's favorite food is rat, although he'll also eat bird eggs, insects and plants if necessary. He likes to live on open grassland or in forests that aren't dense with trees. Here you'll find mongooses living in burrows, which they either dig themselves or use ones abandoned by other animals. In some places, the mongoose has adapted to living in trees or partially in water, with burrows along river banks. Mongoose predators are jackals, snakes and hawks. Fortunately for the mongoose, he's immune to snake venom, according to scientific research by Sarah Fuchs at the Weizmann Institute, which explains why Rikki-Tikki-Tavi was able to win a battle with a cobra in Kipling's story. The banded mongoose of sub-Saharan Africa is one of the most populous species and therefore not endangered, according to the International Union for Conservation of Nature. He is found in every country from Senegal and Gambia in the west to Eritrea, Ethiopia and Somalia in the east and into South Africa. The only countries where he doesn't appear are Sierra Leone, Ghana, Liberia and Niger. The dwarf mongoose species is another species with wide distribution across Africa, although his cousin, the Somali dwarf mongoose only lives in Somalia, Ethiopia and Kenya, according to IUCN data. The Indian grey mongoose isn't confined to living in India. You'll also find him in the surrounding countries of Pakistan, Sri Lanka and Nepal. Further afield, he is found in Iran and Afghanistan and even in the central and eastern countries of the Arabian peninsula, such as Saudi Arabia, Kuwait and Bahrain. This mongoose species has also been introduced into Japan, according to IUCN. The organization also reports that this is one of the least threatened mongoose species, mostly because it has one of the largest populations. In India the grey mongoose is a legally protected species and in central India it is treated as a sacred animal that may not be killed. In the 1800s, sugar cane plantations in Hawaii and the Caribbean islands introduced mongooses to control the rodent population that was overrunning the fields, according to the National Geographic. Unfortunately, this proved counterproductive because the mongooses killed the indigenous animals as well as the rats and posed a threat to native birds by eating their eggs. How Does an Elf Owl Survive? Can I Keep a Mongoose as a Pet? What Snakes Are in Siberia?